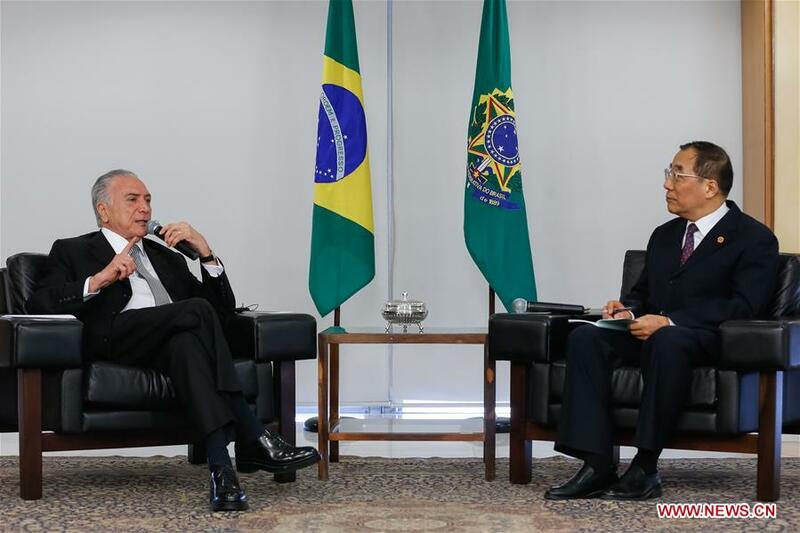 BRASILIA, June 30 (Xinhua) -- Brazilian President Michel Temer met with Yang Xiaodu, a member of the Political Bureau of the Communist Party of China (CPC) Central Committee, in the presidential palace in Brasilia on Thursday, with both sides pledging to enhance China-Brazil cooperation. Yang, who is also deputy secretary of the CPC Central Commission for Discipline Inspection and head of the national supervisory commission, said bilateral ties have evolved into a mature stable relationship between major developing countries since China and Brazil established diplomatic relations 44 years ago, with bumper harvest reaped in various areas. Chinese President Xi Jinping have met with Temer several times in recent years, which opened up new vistas for the development of bilateral ties in the new era, Yang said. China is willing to work with Brazil to implement important consensus reached between the two leaders and promote the in-depth development of China-Brazil comprehensive strategic partnership, Yang added. The CPC is willing to build a new type of inter-party relations with Brazilian political parties on the basis of seeking common ground while shelving differences, respecting each other and learning from each other, said Yang, adding that such efforts will help with their respective national construction and promote common development. For his part, Temer said Brazil attaches great importance to its relations with China and welcomes more Chinese companies to join Brazil's investment partnership program, so as to optimize and upgrade pragmatic cooperation between the two countries. Brazil supports its political parties to deepen exchanges and mutual learning with the CPC in a bid to promote stable sustained growth of bilateral ties, Temer said. At the invitation of Brazil's ruling Brazilian Democratic Movement (MDB) party, Yang, who headed a CPC delegation, visited the South American country from Thursday to Saturday.